Following a unique partnership with the landowner, the Drummond Estate, Arriva is set to introduce ArrivaClick, its innovative demand responsive ride-sharing service to the residents of New Lubbesthorpe from 29 April 2019. 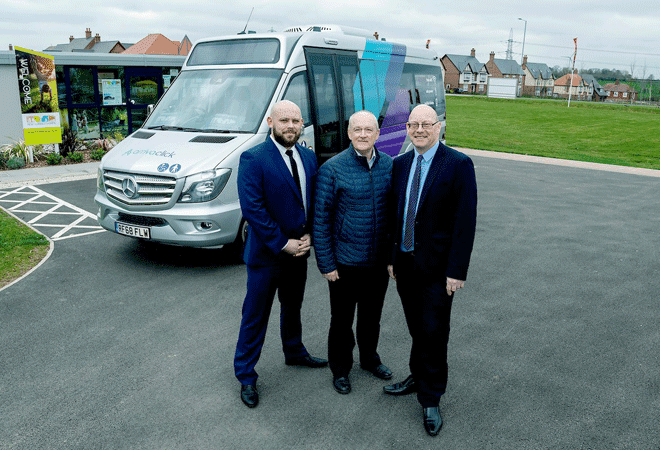 Marking the first time in the UK that funding from a Section 106 agreement has been used to fund a digitalised Demand Responsive Transport (DRT) service, ArrivaClick will be introduced at the development as part of Drummond Estate’s drive to provide a sustainable way to work, live, learn and play for those living in New Lubbesthorpe - a pioneering new community to the west of Leicester providing new homes, schools, community facilities and an employment park adjacent to the M1/M69. The service will deliver shorter end-to-end journey times for customers. Booking by the ArrivaClick smartphone app, customers request an executive minibus from their pick-up point at a time they want and to a destination of their choosing, their journey is then matched with other people heading towards the same destination. Customers are then given a cost and pick-up time for the journey, and once the journey is accepted, are guaranteed a seat on the high-specification minibuses, which can accommodate up to 15 people (or 12 when including a wheelchair or pushchair using customer). New Lubbesthorpe is an initiative of the Drummond Estate. A new £15 million motorway bridge has already opened to provide greater connectivity and the first phase of 500 homes is well underway. The first primary school will be open for September 2019 intake. The proposals will be built-out over the next two decades and will grow into a truly sustainable 21st century new community. New Lubbesthorpe promises to be one of the most attractive places to live in the region, also providing 325 acres of new parklands for local residents to enjoy.